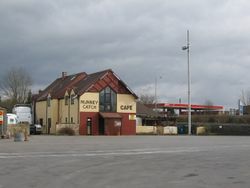 The Nunney Catch Roundabout is home to a small service station, and also the Nunney Catch Truck Stop and Cafe. HGVs are advised to use the latter instead. The Nunney Catch Cafe overlooks the services. Ridgeway, which runs through the petrol station, is a historic route. Nunney Catch Farm was carved up by the new roads and lends its name to the service station. The Frome branch of Little Chef opened here in 1989 and closed in around 2005. It became The Catch Cafe, now Ola Barbeque.